Reeses Peanut Butter Cup Cookies Recipe, these easy peanut butter cup cookies are sure to be your next family favorite! I admit it, I am a chocolate peanut butter addict. If something has this combo, I’m in love, that’s just how it is. So, naturally, Reese Cups are my absolute favorite candy. It’s a problem. 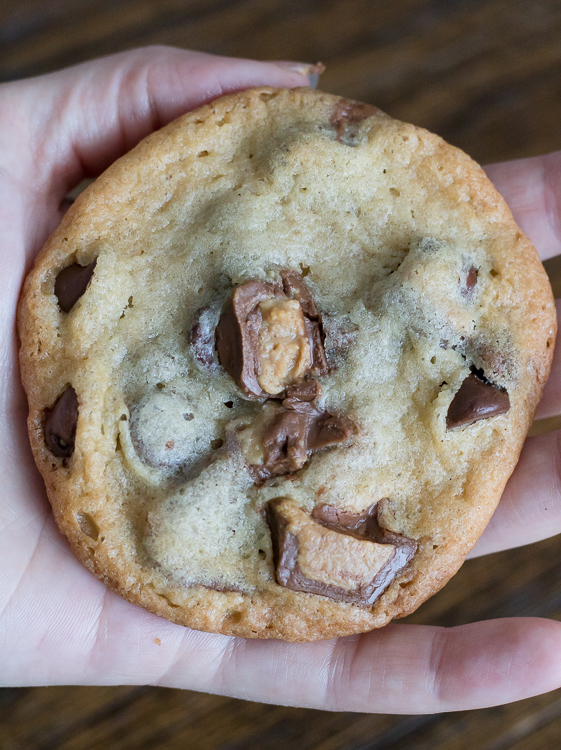 I also love a simple, classic chocolate chip cookie. I mean, what’s not to love?? I like them soft and chewy and I have a pretty amazing recipe for the classic… humble brag, I know! So, why not mash up my two loves into one epic cookie? And, yes, the results were EPIC. WOW, these are definitely my new favorite cookie and I know they will soon be yours too. 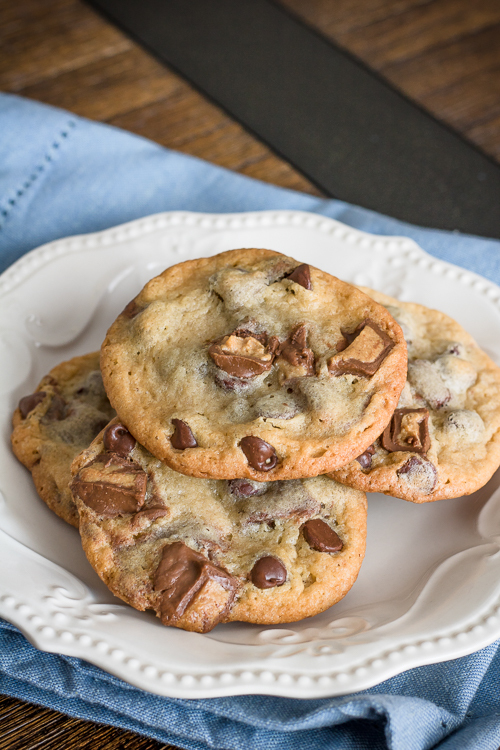 I don’t know if I can ever make plain chocolate chip anymore, they are that good! 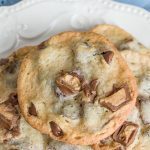 Okay, let’s be real… I will still make my traditional chocolate chip cookies from time to time but when I want a little more pizzazz I’ll make this recipe instead! First, make a basic chocolate chip cookie batter by creaming together softened butter, granulated sugar, and brown sugar. I use a hand mixer for this, but feel free to use a stand mixer if you wish. Mix in eggs and vanilla, mix until combined. Mix in dry ingredients. Fold in chocolate chips and chopped up mini Reese cups. Let dough chill in the fridge for at least one hour. Bake tablespoon sized cookies at 375 degrees for 9 minutes, no more, no less. They might not look completely done on the inside but the cookies will keep cooking while they cool. 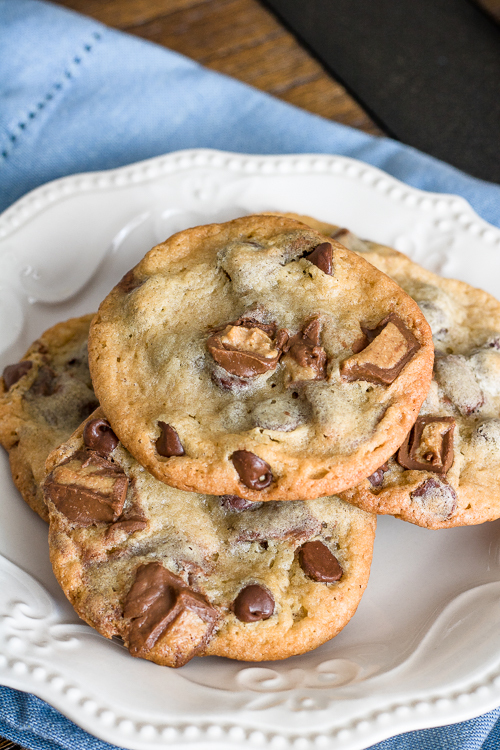 To obtain a soft and chewy cookie, you really cannot overbake these. If you wish, do a test run of one cookie to get the cooking time down first before throwing in a whole tray. 9 minutes in my oven works perfectly every time. 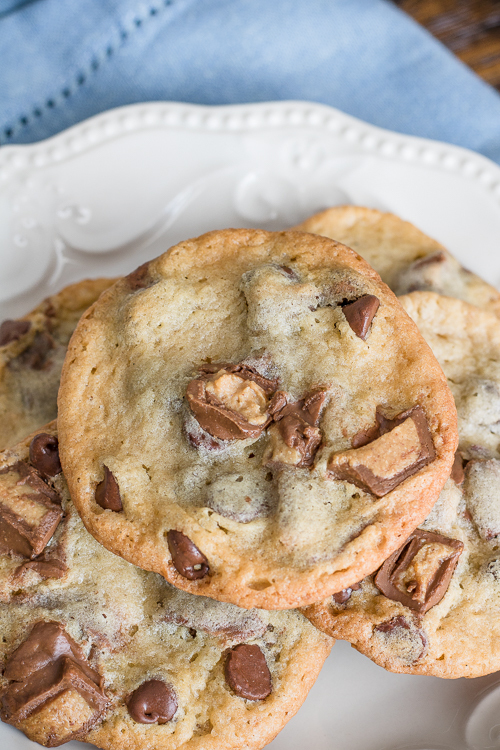 I really hope you like this epic Reese’s peanut butter cup cookies recipe! For even more yummies please visit my blog https://ThisSillyGirlsKitchen.com, see you there! In a medium-sized bowl, add the flour, baking powder, salt, and baking soda. Mix to combine, set aside. In a large bowl, cream together the butter, granulated sugar, and brown sugar until creamy with a hand or stand mixer. Add the eggs and vanilla, mix to combine. Slowly add the dry ingredients a little at a time until fully mixed. Fold in the chocolate chips and 1 1/2 cups of the Reese cups. Place bowl in the fridge for one hour to chill. Preheat oven to 375 degrees. Dollop 1 tablespoon-sized dough balls onto parchment lined baking sheets, about 4 inches apart. Taking the remaining cut up peanut butter cups, add one on top of each piece of cookie dough for presentation. Bake for 9-10 minutes but do not overbake. Cookies will look slightly underbaked in the center. Let cool on a sheet tray for 5 minutes, transfer to a wired rack to cool completely.